I started trying out duck eggs a couple years ago, since my favorite farmers’ market stand would always sell out of chicken eggs by 8:30 AM. At first I was freaked out (largely because I can’t stand goats’ milk, so I’ve been paranoid to switch animals all willy-nilly!) 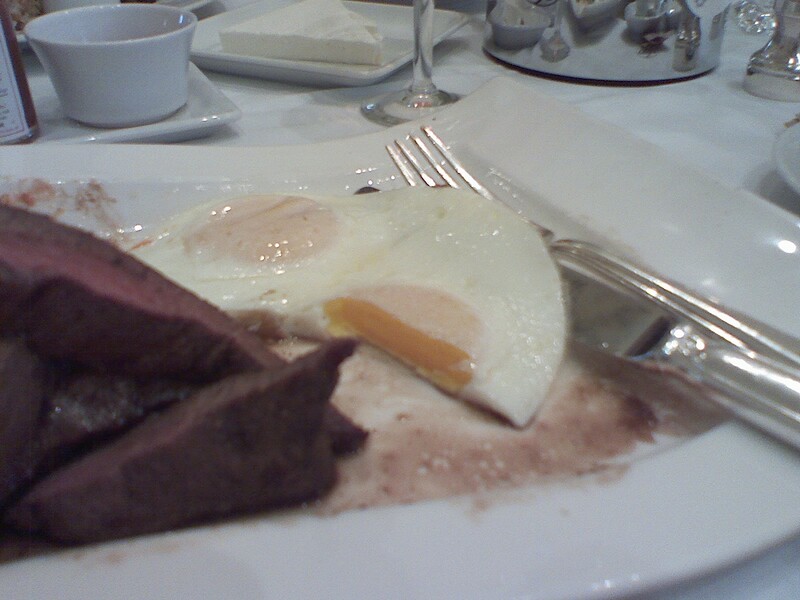 but I soon discovered that duck eggs are delicious. And they’re also more nutritious in many ways, and they hold up better in baked goods. So I was extra-thrilled to find out that Madison Market sells duck eggs — I thought I had to get myself to the farmers’ market to enjoy them. Sure, they’re kinda misshapen and weirdly colored, and they don’t even come close to fitting in those cardboard egg trays. But that’s part of their charm! I think hard-boiled duck eggs are much more flavorful than chicken eggs. (Initially I was worried because the lying, mean Internet made me think they would change color. 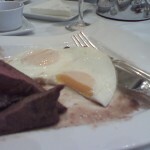 But, as you’ll note from my photo, hard-boiled duck eggs are just as white and yellow as ever.) And for some reason, chicken egg yolks sometimes gross me out, but duck egg yolks are creamy and rich and wonderful. I also think duck eggs work better in dishes like potato salad. 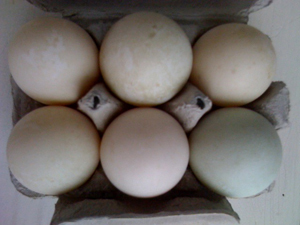 I’m thrilled that the ducks are back in action — I can finally start incorporating duck eggs into my cooking again! I just enjoyed a lovely snack of a hard-boiled duck egg with Barrique Chardonnay finishing salt — delish! I actually had Green Eggs and Ham for breakfast today. It was delicious (they were delicious?). Good stuff. And the eggs had cilantro and poblano chiles and tomatos, and it was a flavor combo that reminded me of Mexico, in a good way – which was wonderful, because I feel sort of oddly guilty that I don’t have more positive memories of Mexico; like perhaps I owed the country more than I gave it or something – anyway, things that give me happy Mexico memories make me particularly pleased, because I guess the good stood out that much more profoundly because it was against such a bleary backdrop for me. In summary: yum.